The National Gallery of Art’s portraits of George Washington and John Adams are among a select group of 16 Federal-era paintings in its collection by American master Gilbert Stuart (1755–1828) that are being conserved through a grant from the Bank of America Art Conservation Project. Also undergoing conservation are 19 other cultural and historical treasures in museums throughout the world, thanks to the company’s global art conservation initiative. From presidents and politicians to war heroes and wealthy businessmen, Stuart painted virtually all of the foremost political figures and members of notable families. He demonstrated an astute ability to capture not only the physical appearance of his sitters but their spirit and intellect as well. No artist provides a more complete or more vivid visual record of the men and women of the early republic. In addition to the works undergoing conservation, there are 13 paintings by Stuart on permanent display in the West Building galleries. They include the famed Gibbs-Coolidge portraits, the only surviving set of portraits depicting the first five American presidents—a must-see as visitors flock to the National Mall for the Fourth of July holiday. This fall six of the newly restored works will be unveiled to the public on October 7, 2012, in the installation of Masterpieces of American Furniture from the Kaufman Collection, 1700–1830 on the Ground Floor of the West Building. Many of the 16 works being conserved entered the Gallery’s collection after being passed down through generations of private owners―oftentimes relatives of the sitters. Some have varnishes that have discolored with age, old retouchings that do not match the original paint, and structural problems such as cracks in the paint. 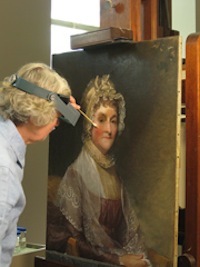 Under the supervision of the Gallery’s paintings conservation department, a team of conservators, including independent conservators Lance Mayer and Gay Myers and Gallery conservator Joanna Dunn, are examining, cleaning, and restoring the portraits.